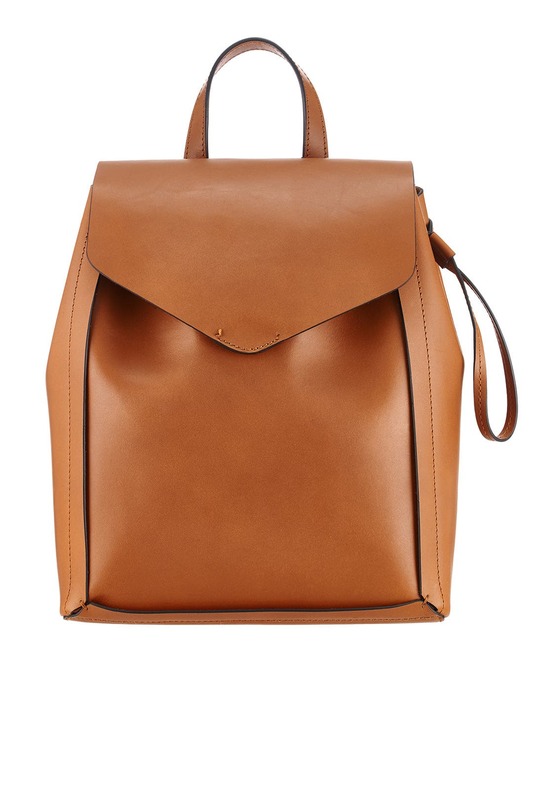 In rich saddle-brown leather, this backpack by Loeffler Randall is functional and super chic. 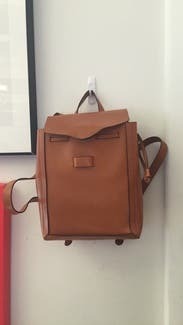 Brown vachetta leather backpack with magnetic flap. Drawstring closure and internal pocket. 10"L X 5.5"D X 11"H.
This backpack is really nice! The leather is really sleek. It's a good size to fit all the things you need for the day (not big enough for a laptop or anything though). Only downside is that it doesn't zip and its hard to get things into the pockets (the leather makes them very tight). I get nervous having something on my back without a zipper, but since the leather is a bit stiff, it's actually pretty hard to get into. This bag is super cute and perfect for a weekend away. Used it for gym clothes then used for a picnic. Fits small laptop, shoes and other items. Matched with everything and carried everything that I needed for me trip to Colombia. Cons: Not water proof so I carried a waterproof bag to cover it (duh...it's leather) and strap was uncomfortable at the beginning but got used to it. Lovely and sleek bag. Was perfect for an all day on the go work event. Didn't fit my mac air. 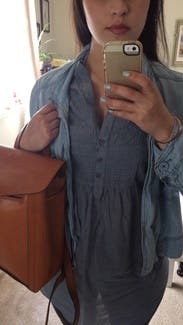 Received many compliments and many people asking where they could buy this bag! Structured little pack had room for a waterbottle, book, light jacket and other essentials. Has one inner zipper pocketed and two other pockets. Super cute bag! Loved it! I rented this dress for a vacation to Ireland and did not want to give it back! It has more than enough room to fit the essentials and more. Don't be worried about the fact that there are no zippers. Once you tighten the side straps and clasp in the button there is no way someone can get into your back unnoticed. I also rented this bag in black for another international trip (this time to Peru!) and my feelings toward the bag definitely did not change! I was hoping this would fit my MacBook air (I have the smallest size), but unfortunately it's too small. Gorgeous though and came in great quality. Beautiful leather, but too delicate. The construction of this backpack is great, however its a bit tedious to get in and out of. And the leather scratches extremely easily - if eve your fingernail hits it in the wrong way a mark will be left. Great to look at, but not suitable for everyday use. This bag is so beautiful. Structured but soft and very practical. I love it. 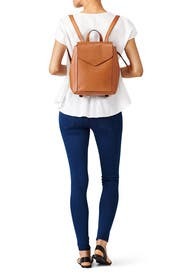 Rented this for everyday and used it - It is a fun backpack but the straps are a bit stiff and uncomfortable - I rec'd the backpack brand new so it might take a while for the straps to get worn in and lose some of the stiffness. Otherwise it is a fun, convenient piece - good for casual travel type days walking around. Little bit bigger than I expected as well - so just check the dimensions before you order. This bag is made of fine leather with a smooth and sleek finish. Color is beautiful. 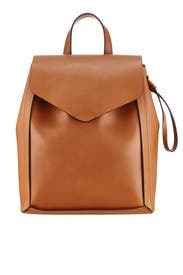 I only gave it 3 stars because I found the shape of the backpack to be annoying to sling around for everyday wear. 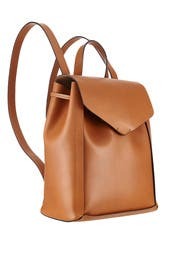 Also, was looking for a bag that was very on trend, but instead I felt this bag aged me a bit. So convenient, so chic. Wish I had a job where I could get away with having a backpack as a purse, because I would have held on to this for weeks. The leather is sturdy and strong. It's the perfect size for throwing in wallet, sunglasses, makeup bag, etc. I really wanted to like this, but it was extremely structured so I felt like I was putting a shell on my back every time. Because of this, it just stuck out more than I wanted. I ended up sending this back without ever wearing it. I really love this bag and use it for my purse which I also carry papers and a small computer in. The only complaint I have is the closure method is a bit difficult. Perfect size. Feels fantastic. color is gorgeous. Great size, easy to carry. Came in great condition. Will probably get it again. I took this bag with me to an outdoor music festival and it was perfect for the event. Held everything I needed and was just the right size. I would rent this again! The bag was perfect! Beautiful, practical and comfortable. It was received brand new, so the leather wasn't broken in, but I didn't mind. The color was beautiful. The bag is very structured, so it is kind of like carrying a briefcase on your back, but very comfy. I felt it looked classic and expensive. I would have loved to keep it and will probably rent it again. Perfect everyday backpack! Rich color & leather. 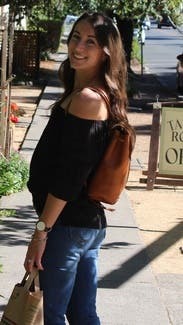 This backpack was lite weight & easy to wear. It's a great quality of leather and the straps are adjustable which is nice. I took this with me for an anniversary trip to CA & I wore it every day. Nice change from a purse, especially since I had my camera. I'll definitely be renting this again! Beautiful material, fits more things than expected. This is a versatile and very beautiful backpack that fits more things than I expected from the pics. SO easy to combine, you'll wear it all the time. I bike a lot, and it was perfect for rides.